Providing you the best range of bar threading machine, semi automatic bar threading machine, 3 phase bar threading machine, rebar threading machine and buildtech bar threading machine with effective & timely delivery. We are offering our esteemed customers with the finest range of Bar Threading Machine. Known for offering the premium products, the company is acknowledged for the low pricing and timely bound delivery in the market. 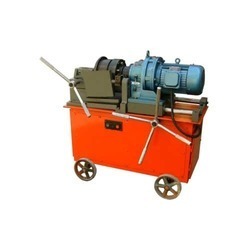 Consequently Bar Threading Machine is highly reliable and has more service life. Superior Quality, efficient functioning and flawless finishing have made it possible to gain a competitive edge in the market. Our offered product range is processed under the strict supervision of experts, using the high grade technical skills and advanced machinery and other related equipments.